MUSIC FunTime - The Magical Connection of Math & Science through Music is now available to you with an innovative new group program for children ages 18 months through 7 years. Music FunTime is different than the typical preschool music program. Music FunTime is not a simple play group where children sing, dance, jump & play instruments. We offer an innovated new program, geared from the Johns-Hopkins Research that children 7 and under can learn to read music notation and symbols, eventually, learning to play instruments. If a child can learn their letters, numbers, shapes, animals etc., why can’t they learn to read music? Through crafts, worksheets, games, instruments, singing, & very small group classes, we teach children in a fun & exciting way, how to play and read music. Class excitement has proven over & over, the children’s enthusiasm to look forward to weekly music lessons. Parents participate in class. We change the curriculum every 5 minutes accommodating child’s attention span. All lessons are geared towards the piano because the piano is a string & percussion instrument. Children not only learn timing, rhythm & tempo they also learn the notes on the grand staff, such as…e,g,b,d,f (every good boy does fine) etc. Our children also perform at public functions singing with their instruments, a minimum of 2 times per year. All students are invited to take a free trial class. You and your child will explore music, dance and sing together and more. Your child learns to share, take turns and develop the skills they’ll need in school and on the neighborhood playground. Our Music FunTime classes bring you closer as a family. They are fun, yet educational and an important part of your child’s development. In this special place for musical, social and emotional learning, your children will strengthen their ties with each other and with you! As a result of our daughter’s music lessons with Music FunTime, she is more confident, communicative, and has developed an increased attention span, in addition to a growing appetite and appreciation for various types of music and musical instruments. All of this, and she is not even 2 years old! We are very much looking forward to continuing on this journey of discovery and learning with Music FunTime. People can’t believe that Courtney is four years old and reading music. Courtney loves the crafts, interaction with the other children, and the performances. As an educator, I see all of the benefits of learning music at a young age and how it is developing her reading and math skills. The teacher is great with kids and knows how to get them to work hard while having fun! Students are given a backpack of rhythm instruments at registration to use in class and at home. Throughout the course, additional instruments are provided adding variety, diversity and fun! All students are introduced to piano, guitar, percussion, violin, bells, kazoos, flutophones, recorders and harmonicas. We’ll teach your child to read music in the same manner they are taught letters, numbers, colors, shapes, etc. We’ve created an array of colorful music teaching tools and worksheets that teach rhythm, pitch, notation, symbols and key signatures. 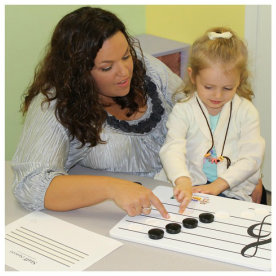 Our special “musical crafts” lessons teach children music theory in a fun, artistic way. Kids love it! Music FunTime offers students the opportunity a few times a year to rehearse in a larger group and perform at public venues. This gives the children the understanding of listening to other performers and grows confidence in themselves. In succession of all the popular reports out of Congress and studies at Johns-Hopkins Research Center about the Magical Connection between Math and Music, we are happy to announce Music FunTime teaching music to children ages 18 months thru 7 years through rhythm, pitch, theory and technique. Math and Music unite the two hemispheres of the brain – a powerful force for learning. Did you ever consider the skills your child uses when he/she sings a song such as “This Old Man”? He/she is matching and comparing (through pitch, volume and rhythm), patterning and sequencing (through melody, rhythm and lyrics), counting numbers and adding. Add dramatic hand movements or clapping to the beat and you have created an entire package of learning rolled into one song. In recent years, there has been considerable amount of research on the effect of music on brain development and thinking. Neurological research has found that the higher the brain functions of abstract reasoning as well as spatial and temporal conceptualization are enhanced by music activities. Activities with music generate the neural connections necessary for using important math skills. Music is considered a right brain activity, while Math is a left brain activity. When combined, the whole child is engaged not only in the realm of thinking, but in all the other domains of social, emotional, creative, language and physical development. Together they make a complete developmental package. Music FunTIme is an All Inclusive Program! Instruments, Tools, Music and More is included in this amazing Music class! If you are ready to start, you have nothing to lose as we only want students who truly want to be here and we will not commit you to a long term contract. Norfolk, Portsmouth, Virginia Beach, and North Eastern North Carolina.